ChloroFields LLC of Lawrence, KS announced today its new food safety initiative which is due to be launched in 2015. 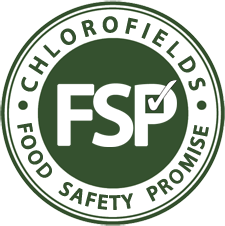 ChloroFields’ new trademarked seal, the FSP, is the capstone of the company’s commitment to food safety, good manufacturing practices, and customer’s expectations of quality and reliability . The FSP, or Food Safety Promise, is a commitment by ChloroFields to adhere to certain practices which have shown to reduce the likelihood of microbial risks associated with produce and in particular, sprouts. One of the key tenants of the FSP for ChloroFields is its newly updated and validated lab procedures. The lab will be used to identify risks of food pathogens such as e. coli, salmonella, and listeria monocytogenes. ChloroFields has partnered with Neogen to help implement a lab safety solution to those microbial risks. Neogen Corporation (Nasdaq: NEOG) develops and markets products dedicated to food and animal safety. The company’s Food Safety Division markets dehydrated culture media and diagnostic test kits to detect foodborne bacteria, natural toxins, food allergens, drug residues, plant diseases and sanitation concerns. The ChloroFields Lab will use AOAC validated methods to test production lots, and will ensure that sprouts are held and tested before they are packaged. Additionally, ChloroFields will conduct periodic environmental samples of the facility to assess its quality and create measurable benchmarks of cleanliness and safety. ChloroFields has identified that this is one more step towards preserving the good reputation its sprouts have earned. Many customers have enjoyed the organic line of sprouts since it was introduced in mid-summer 2013. The company hopes to maintain its solid reputation through safety and customer satisfaction.